"Where Do We Go?" is the latest release by Germany's high-priests of 60s-garage-acid-syke, THE SATELLITERS. 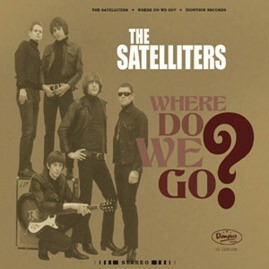 This album includes 10 original and all-new SATELLITERS songs plus 3 cover-versions: The BIRDS "No Good Without You Baby", "I'll Make You Sorry" by THE SHADOWS OF KNIGHT and THE PARAGONS-smasher "Abba". This mind-blowing release is housed in style by famous European designer, T.Eschweiler. Along with the albums "High Karate", "Sexplosive", "Wild Knights of Action", "Hashish" and the EPs "...Shake Shake Shake" and "The Satelliters", "Where Do We Go?" is an essential and important recorded milestone for fans of fuzz.